Boy do we have a treat for you today! 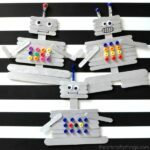 If you are looking for a cute and simple craft for kids to make for Valentine’s Day, you are going to love this adorable Robot Valentine Craft. It couples both as a cute Valentine craft and a sweet Valentine card that kids can give to their Mom, Dad, grandparents or friends. 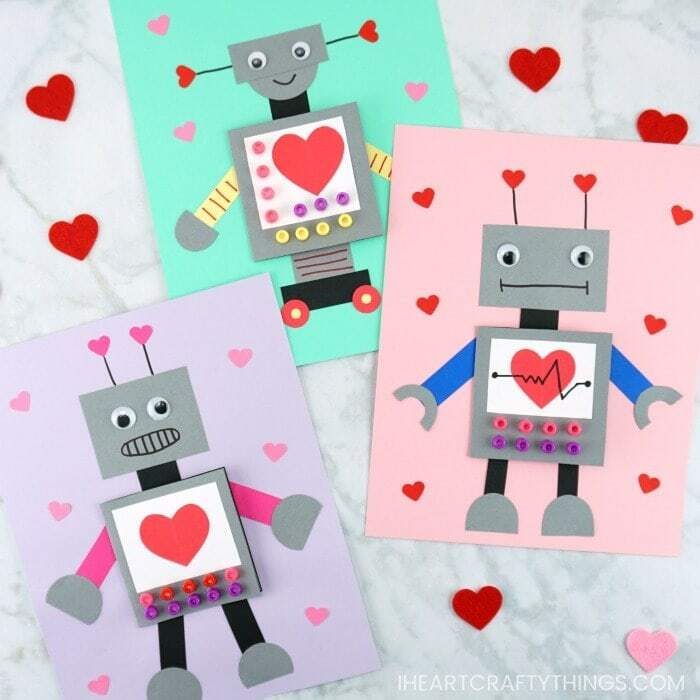 In this post, learn how to make this cute robot Valentine craft with our helpful template, step-by-step tutorial and video. 1. 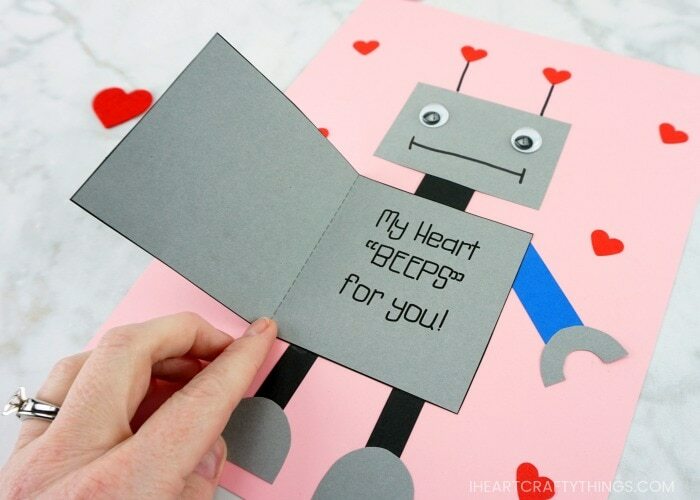 Begin by downloading and printing out the robot Valentine craft template on gray cardstock. 2. Cut out the card you would like to use from the template and then fold it in half along the dashed line on the template. 3. Choose a color you would like to use for the background of your robot. 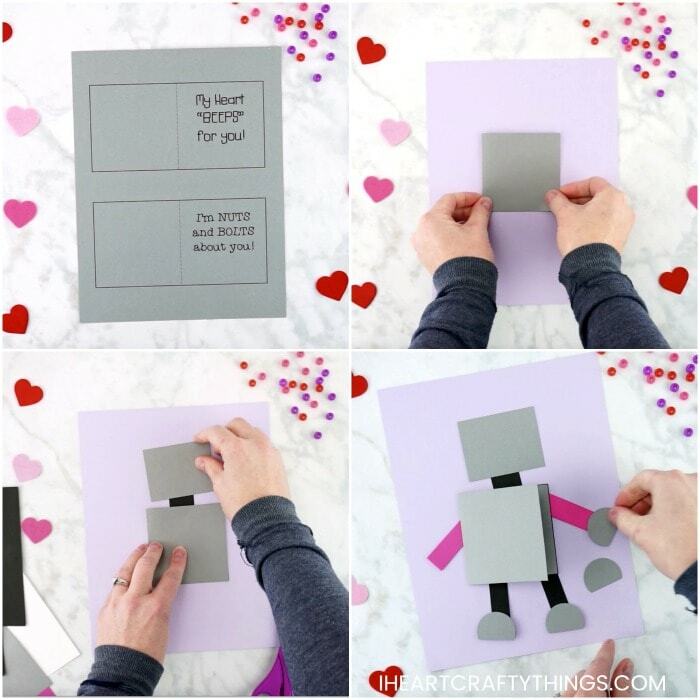 Place your folded Valentine card in the middle of the cardstock to begin designing your robot. 4. 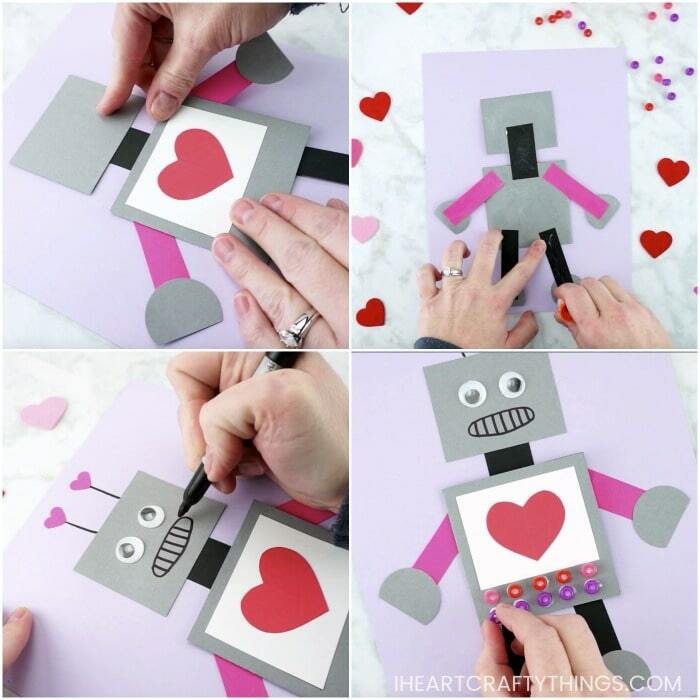 Use different colors of cardstock to cut out different shapes to design a robot around the Valentine card. This is a great opportunity for kids to use their creativity to design their own unique robot. For now, simply lay the pieces out on your cardstock as you design your robot. 5. For the front of our Valentine card we cut out a red heart and glued it inside a white rectangle. Glue this piece on the front of your Valentine card. 6. 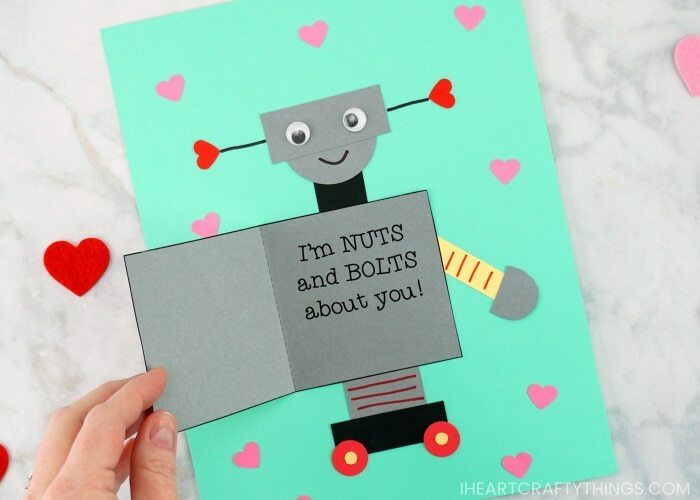 When you are happy with the design of your robot, glue the individual pieces onto and around the Valentine card. Then add glue on the back of the robot and glue it down on your background cardstock paper. 7. 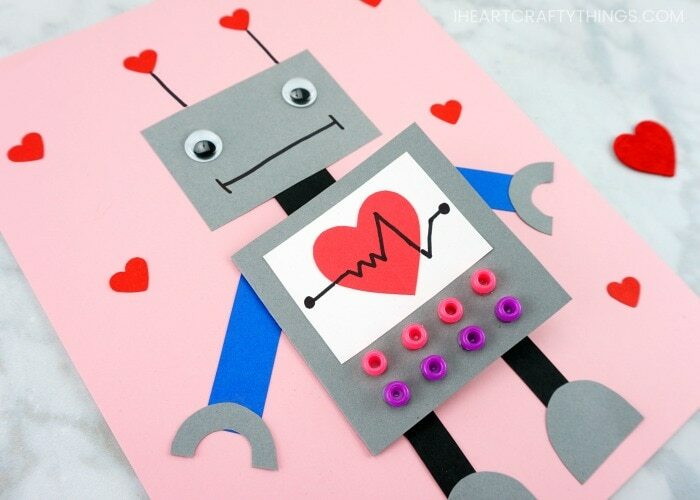 To make your robot Valentine craft extra festive, cut out small hearts with a heart punch and glue them at the top of your robot for antennae. You could also use small heart stickers. 8. 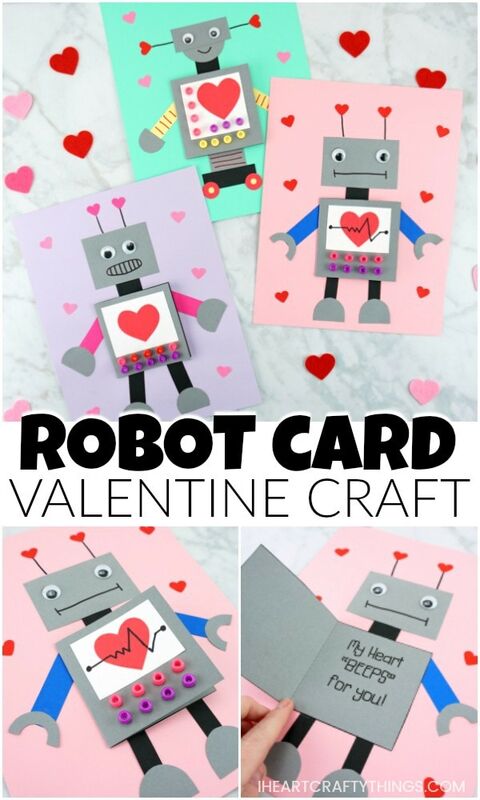 Glue googly eyes onto the face of your robot Valentine Craft. 9. Use markers to add details to your robot like lines to connect your antennae to the robot head and a smile. You might also like to add lines on your arms or legs. Or for an extra fun treat, draw a heart monitor across the heart in the center of your Valentine card. If you don’t like either of these sayings you can simply cut out a rectangle from gray cardstock, fold it into a card and then write your own personal message on the inside. 10. Add some Tacky glue dots on the front of your card and glue pony beads on it. This fun touch looks like knobs and buttons on the front of your robot. It also adds a great dimensional touch to the Valentine’s Day craft. For an extra special Valentine’s day touch, cut out small hearts from a heart punch and glue them around your paper. You could also use heart stickers as an alternative. 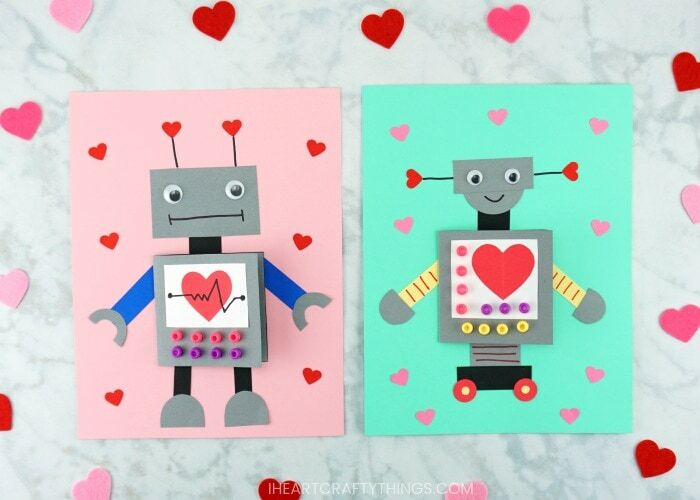 Watch the video below to be guided through each step of this Robot Valentine Craft. Are you into the Llama craze lately? 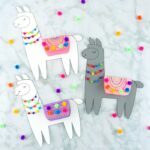 If so, you’ll love this darling Llama Valentine Craft. Our template makes the craft super easy to make. 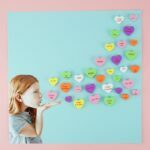 This sweet Valentine craft will blow someone away! The sweet conversation hearts being blown off the hand is absolutely adorable. You are not going to believe how easy this 3D Hot Air Balloon Card is to make with our handy template. Friends and family will adore receiving this colorful Valentine.